More appropriately, I should say Calling all Restauranteurs. It’s those folks who’ll probably need to help me get an In-N-Out Burger in Chicago. Before I get into this, let me ask you this: Do you know anyone that plans a trip to one of the most fertile, agricultural regions on earth and fantasizes equally about experiencing wine from that region and fast-food burgers from that region? Well, if you don’t, now you do. Me! We made a trip to Santa Barbara wine country and as soon as we got on the road for the two plus hour ride north from LAX, my head was on a swivel trying to spot my first In-N-Out Burger. It was actually about 36 hours into the trip before I got to experience the cheeseburger and fries pictured above. Man, they were good. Even my wife, the lover of cooking and French cuisine, was impressed with the burger. If you look in the background, you’ll see my wife’s ring-clad hands wrapped around her cheeseburger. ‘Twas a special way to share a quiet evening with the person you love on the central coast of California. 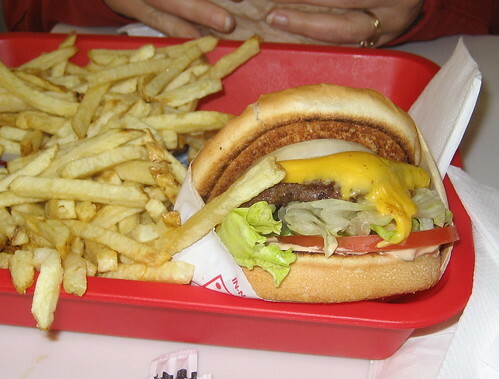 In-N-Out has four food items on the menu; hamburger, cheeseburger, double cheeseburger, and fries. Then for drinks they have the standard sodas and water, and a chocolate malt. That’s it. Talk about focus! I got the cheeseburger and it comes with burger, lettuce, tomato, cheese, onions, and special sauce. The burger is made on the griddle and the bun is toasted nice and crispy-like. You can feel the crunch of the toasted underside of the bun. You know me, I’m a straight American cheese and grilled onion guy. But this combo from In-N-Out really tugged on my taste buds. I thoroughly enjoyed it. The fries are hand cut from fresh potatoes all day long. It’s pretty cool. They have this silver machine that you can see from the dining area for cutting the fries. They pop a potato in it, pull the lever, and out drops a stack of fresh cut fries. This place kills. It’s quite a formula. If you drop a few in Chicago you would become a millionaire overnight. I’m working on it, so don’t steal my thunder. Posted in food on 2007/05/01 by John.